Probiotics are the living microorganisms that provide health benefits to the recipient. Lactobacillus and Bifidobacterium genera have been used since long for the competitive exclusion of pathogens from the gut. However, their limitations such as sensitivity to gastric acid, temperature, slow growth, and specific stability conditions lead to search for a novel probiotic that is stable through its shelf-life as well as during gastrointestinal transit; hence, offering better efficacy. Bacillus bacteria have strong scientific data which substantiates the validity of the use as preferred probiotics. 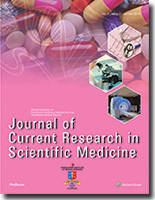 In recent times, there has been significant progress in scientific evaluation and studies on probiotic Bacillus subtilis, revealing possible mechanisms of action like antimicrobial effect by synthesis of antimicrobial substances, antidiarrheal effect, immunostimulatory effect, competitive exclusion of pathogens, prevention of intestinal inflammation, and normalization of intestinal flora. Numerous preclinical and clinical studies on B. subtilis have shown its promising efficacy in the treatment and prevention of diarrhea of various etiologies. B. subtilis is certified as generally recognized as safe by Food and Drug Administration and features in the European Food Safety Authority Qualified Presumption of Safety, hence suggesting as safe for human use. All of these beneficial attributes make B. subtilis the most attractive probiotic species for various clinical conditions. 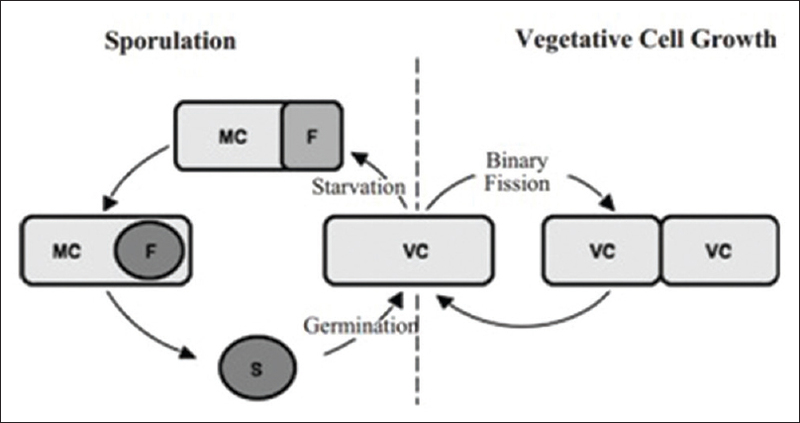 This manuscript briefly describes the concept and terminologies related to survival analysis, characteristics, need, data mechanism, functions, and application in health sciences along with different estimation procedure. Background: Self-directed learning (SDL) is considered as one of the best teaching tools for adult education, which is considered to be associated with the management of lifelong learning, for better outcomes. In line with the Medical Council of India vision to promote innovations in education, to create lifelong learners, and to encourage creative youngsters, SDL sessions were conducted for the third-semester students in the Department of Microbiology. Materials and Methods: An interventional study was carried out among all 96 Bachelor of Medicine and Bachelor of Surgery students in the third semester, in the academic year 2014, at Pondicherry Institute of Medical Sciences for systematic bacteriology topics by the Department of Microbiology. Didactic lectures and SDL sessions were conducted simultaneously. Both sessions were evaluated by a pretest and posttest using MCQs as assessment tool. Students' feedback was also collected. Results: Out of 96 third-semester students participated in the study, 36 were males and 60 were females. 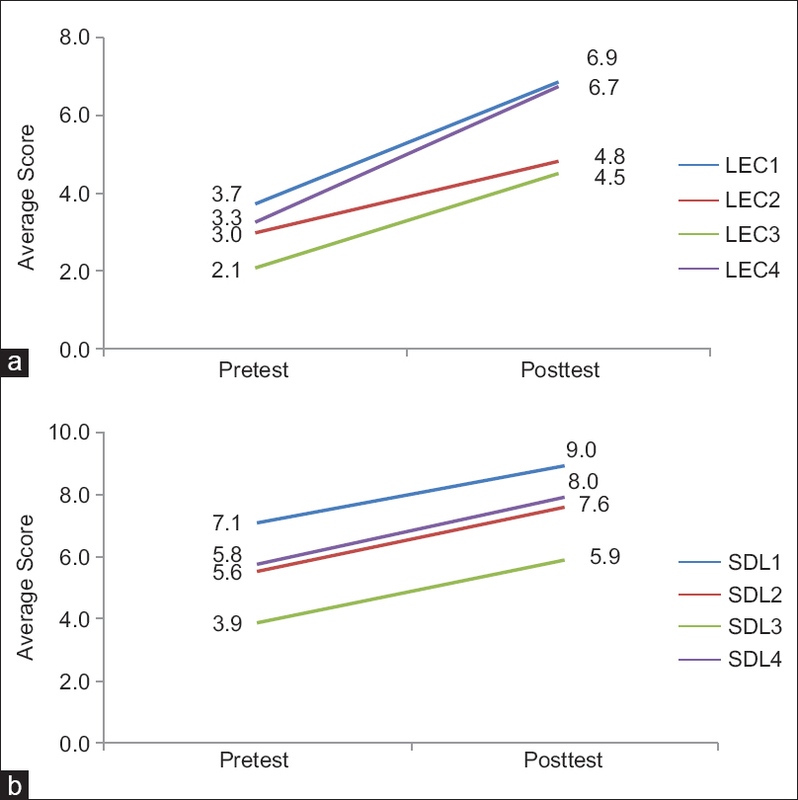 Results of pre- and post-test scores for both sessions were analyzed, which showed an increase in the mean score of 2.70 in the didactic lectures group, as against 2.09 in the SDL group. Anonymous feedback from students revealed that SDL classes were interesting, helped in better understanding of the topics, stimulated reasoning, and helped in active learning process. Conclusion: SDL strategies were found to be effective in stimulating thinking and understanding of the topics and to enhance the cognitive skills among the learners. Aims: The diagnosis of gastrointestinal stromal tumor (GIST) and extragastrointestinal stromal tumor (EGIST) depends on both characteristic histopathology (HP) and immunohistochemistry. The aim of the present study is to study the clinicopathological and immunohistochemical features of these tumors. Materials and Methods: This is a 6-year (2009–2015) retrospective study conducted in a tertiary care center. It includes all the cases of GIST and EGIST diagnosed in that period. Clinical records and HP slides of all cases were reviewed. Appropriate tissue blocks were selected for making a manual tissue microarray. Using the microarray, immunostaining for CD117, discovered on GIST-1 (DOG-1), S-100, desmin, smooth muscle actin, CD34, and vimentin was performed. Results: GISTs (total 10 with 3 low-risk, 4 intermediate-risk, and 3 high-risk type) were abdominal masses located commonly in the small intestines of adult men (mean age 52 years). EGISTs (6 cases all high-risk type) were larger abdominal masses affecting younger patients (mean age 50 years) located in the mesentery and retroperitoneum. All GIST and EGIST showed Cd117 and vimentin positivity. DOG-1 clone 1.1 was positive in 6 of 7 GIST (85.7%) and 2 of 3 EGIST (66.6%). 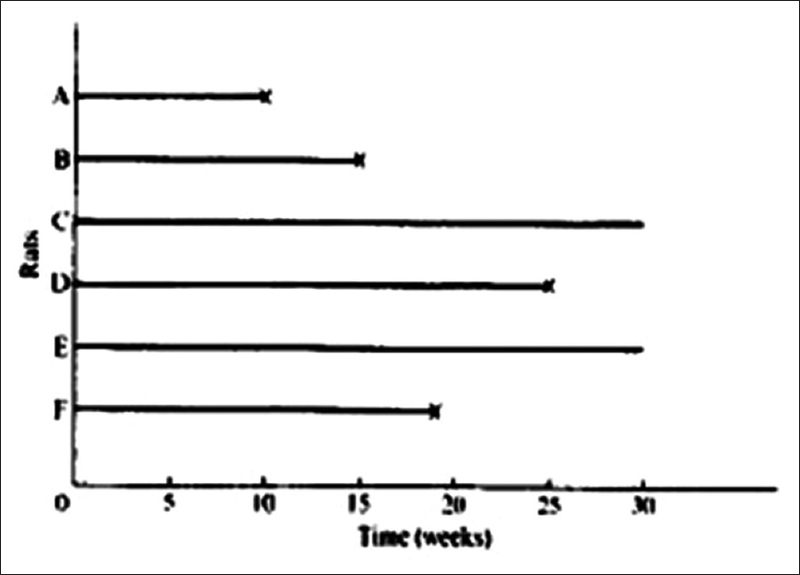 Immunoreactivity for DOG-1 clone K9 was observed in 2 of 7 GIST (28.5%) and in 1 of 3 EGIST (33.3%). Conclusion: This study reaffirms the importance of CD117 in diagnosis of GIST and EGIST. Of the two clones of DOG-1 used, clone1.1 is a more sensitive marker. Background: Frail elderly persons, who are characterized by a greater vulnerability to stressing factors, often present with comorbid cardiovascular diseases. Endothelial dysfunction, a pathological process involved in the development of cardiovascular diseases, can be examined noninvasively through the technique of flow-mediated dilation (FMD). We studied a group of hospitalized elderly persons analyzing their endothelial function by FMD aiming to investigate the relationship between their frailty status and endothelial dysfunction. Materials and Methods: Thirty hospitalized elderly patients were evaluated by ultrasound examination of endothelium-dependent vasodilation of the brachial artery. The Study of Osteoporotic Fracture Criteria for Frailty index was used for the definition of frailty status of enrolled cases. Results: Statistical analysis revealed the existence of significant associations between frailty status, ischemic heart disease (P = 0.013 by Chi-square), and cognitive impairment (P = 0.001 by Chi-square). 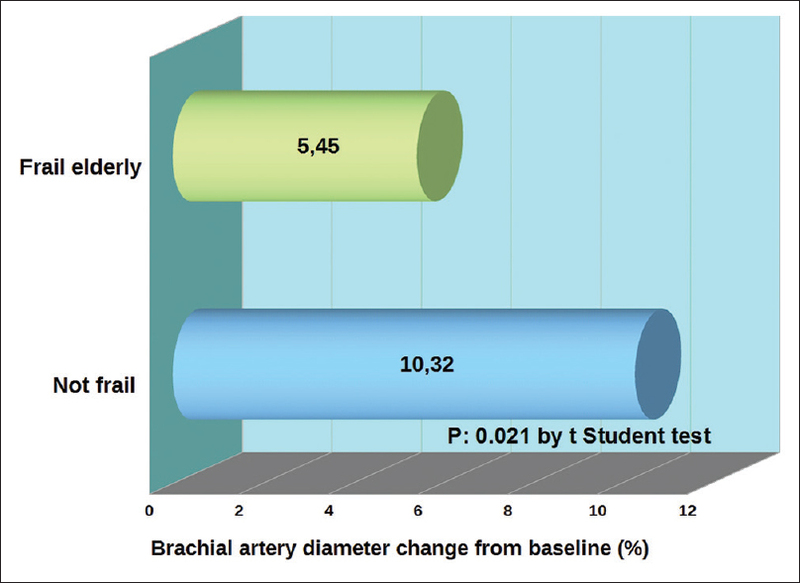 Moreover, frail cases showed lower values of diastolic blood pressure (61 mm Hg vs. 71 mm Hg P< 0.001 by Student's t-test) and a reduced FMD compared to not frail ones (5.45% vs. 10.42%, P= 0.021 by Student's t-test). Conclusions: The identification of reduced FMD in frail elderly may suggest endothelial dysfunction as a pathological “common ground” shared by cardiovascular diseases and frailty. FMD could help clinicians in the management of elderly at risk of developing frailty and cardiovascular disease. In further multicenter studies, FMD could be used to evaluate which early interventions have the potential of preventing the disastrous consequences related to both cardiovascular events and frailty. Introduction: Among the elderly, anemia is a very common problem. Unlike when anemia occurs in younger adults, the cause of anemia in the elderly is often not readily apparent or attributable to a single cause. Anemia in the elderly is a public health crisis because it increases the risk of death by 40%. Materials and Methods: An observational study was conducted on a cohort of patients aged 60 years and above, presenting to our hospital, fulfilling the WHO criteria of anemia. The study was carried out over a period of 2 months (June 2015–July 2015). Results: In our study, of the 150 patients analyzed above the age of 60, 78% (119) were found to have anemia. Mean corpuscular volume was used for morphologic classification of anemia. Normocytic anemia was the most common type of anemia observed accounting for 77%. 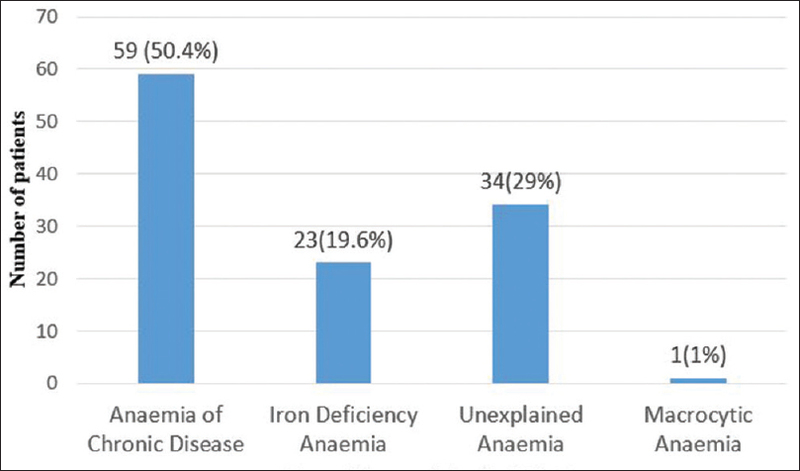 In this study, it was found that majority of the patients (50.4%) had anemia due to chronic disease, followed by unexplained anemia (29%), microcytic hypochromic anemia (probably iron deficiency anemia) (19.6%), and macrocytic anemia (1%). Out of the four chronic conditions analyzed, more number of anemic patients had diabetes, followed by chronic respiratory disease, hypertension, and renal disease. Conclusion: This study has shown that there is a significant number of people among the geriatric population who have anemia, with anemia due to chronic disease and microcytic hypochromic anemia being the most prevalent type. This condition can most definitely be rectified. Management of anemia can definitely improve the condition of the patient. Introduction: Acute kidney injury (AKI) is a complex renal disorder with multiple etiologies and manifestations which vary widely between regions and populations and it is associated with an increased mortality. It is defined by abrupt rise in serum creatinine and/or decrease in urine output to below 0.5 ml/kg/h. Materials and Methods: Patients' records from January 2013 to December 2014 were reviewed retrospectively, and data from those who satisfied the definition of AKI were extracted for analysis using the Statistical Package for Social Sciences software version 17. Results were presented as means, frequencies, and percentages, and the significance of relationships was investigated using t-test or Chi-square test as appropriate. Results: Three hundred and twenty patients, 2.3% of the total hospital adult admissions and 12.5% of adult medical admissions, had AKI. There were 162 (50.6%) males with a mean age of 38.51 ± 16.574 years and 158 (49.4%) females with a mean age of 31.22 ± 13.471 years. The most common causes of AKI were sepsis (37.2%), diarrhea and vomiting (27.5%), and hemorrhage (16.9%). Of those who had sepsis, 70/119 (58.8%) were females while 70/88 (79.5%) of those with diarrhea and vomiting were males. Most patients (58.1%) presented with Stage 3 injuries which had a significant influence on renal outcome and mortality. Anemia was more common in females, i.e., 85/158 (53.8%) than males, i.e., 11/162 (6.8%), but it did not have a significant influence on the severity of injury and the overall outcome. We conclude that AKI is not uncommon in our environment and the outcome depends on the etiology and severity of injury. Hemodialysis treatment given when indicated improved the overall outcome. Cutaneous Polyarteritis nodosa (cPAN) is a rare vasculitis characterized by necrotizing arteritis of small to medium-sized arteries. It manifests as skin ulceration, hypertension, abdominal pain, digital gangrene, and subcutaneous nodules. There is no specific serological marker for diagnosis and confirmation is based on histopathology. Most common mode of pharmacological therapy includes corticosteroid or cyclophosphamide, along with antimicrobials for secondary infection prevention and plasmapheresis. 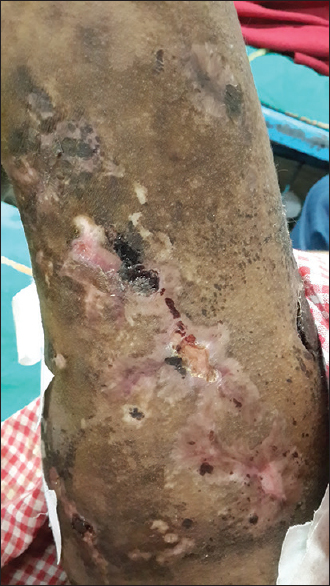 Here, we present a case of a 15-year old boy with multiple skin ulceration, digital gangrene with few nonspecific signs and symptoms, diagnosed as a case of cPAN with features of metabolic syndrome initially, and, underwent regular therapy and follow-up. Search for aesthetic treatment and smile enhancement has persisted in the routine of dental professionals. However, the appearance of black triangles in the anterior region compromises aesthetic looks and hampers one's self-esteem. Etiological factors for open gingival embrasures include aging, periodontal disease, loss of height of the alveolar bone relative to the interproximal contact, length of embrasure area, root angulations, interproximal contact position, and triangular-shaped crowns. Several surgical and non-surgical techniques have been proposed to treat soft tissue deformities and to manage the interproximal space. The surgical techniques aim to recontour, preserve, or reconstruct the soft tissue between the teeth. 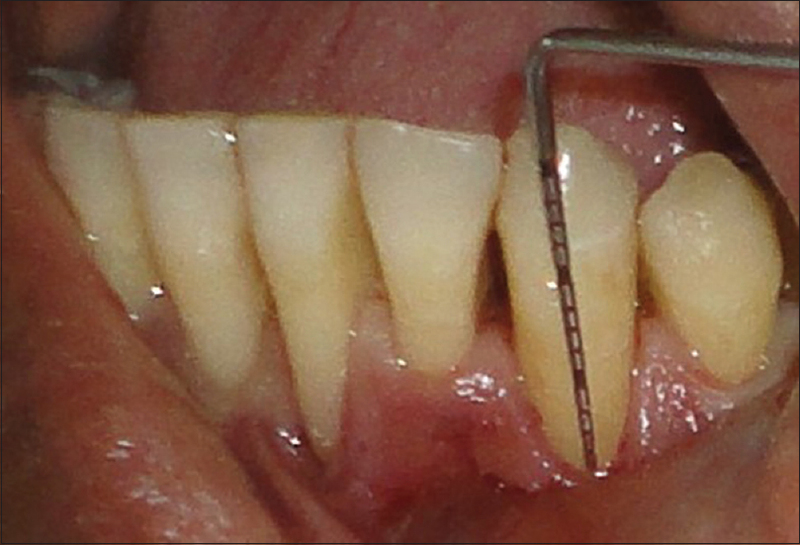 The aim of the present case report is to present a minimally invasive papillary regenerative procedure using platelet-rich fibrin membrane which was tucked into the pouch, followed by coronal displacement of the entire gingival-papillary unit. 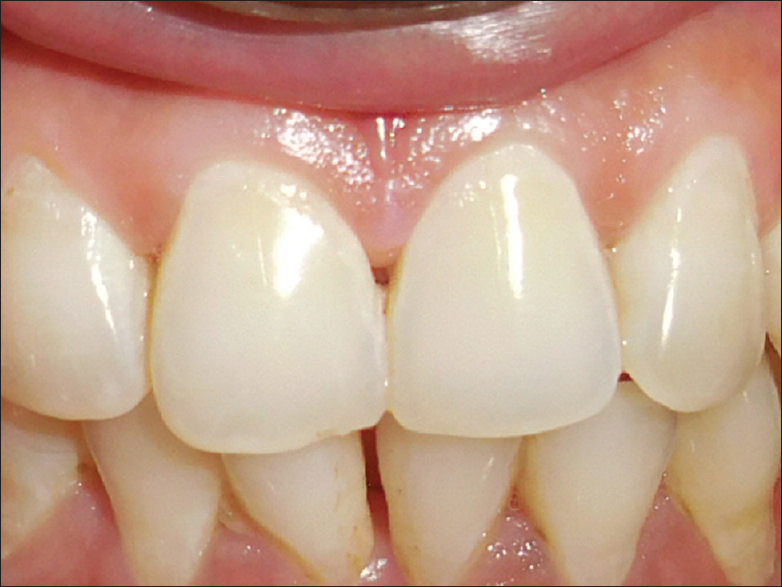 Loss of a single anterior tooth causes a major functional and aesthetic concern to the patient. There are different treatment options available for replacing a missing incisor. If the economic status of the patient permits, it is the responsibility of the clinician to explain the benefits of dental implant to replace a single missing tooth. This case report describes the replacement of a missing maxillary left central incisor tooth of a patient with dental implants for better function and esthtics. Osteochondroma is a benign bone tumor commonly arising from the distal femur, proximal tibia, and the proximal humerus. The common age of presentation is in the first two decades of life, particularly during periods of rapid skeletal growth. Tumors in the scaphoid bone are a rarity. Very few case reports have been published on benign tumors arising from the scaphoid including unicameral bone cyst, osteochondroma, osteoblastoma, and osteoid osteoma. We present a case of osteochondroma arising from the scaphoid presenting with pain and deformity of the wrist in an unusual age group of the first decade. Radiographs and magnetic resonance imaging suggested osteochondroma of the scaphoid. Tumor was resected, wrist deformity was corrected, and functional range was restored. Osteochondroma emanating from the scaphoid is considered to be extremely rare, but when the lesion is large and associated with progressive painful joint deformity as in our case, it warrants surgical resection. External cervical resorption (ECR) is a type of external resorption that can be quite devastating for the tooth and in extreme cases can even lead to tooth extraction. 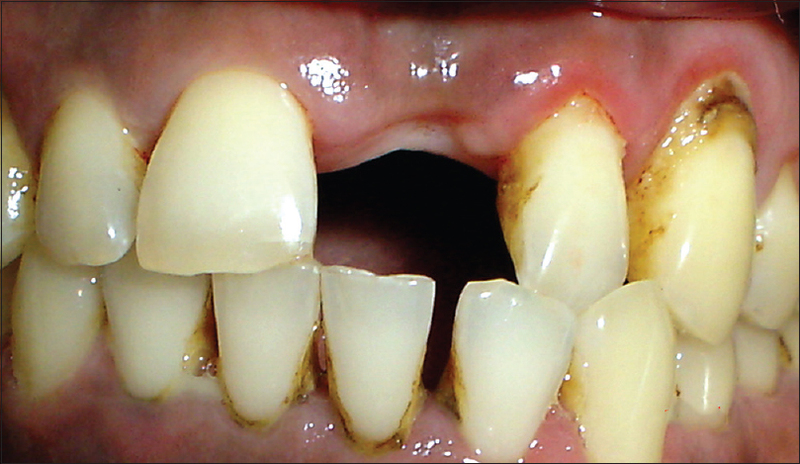 Its diagnosis and management present many challenges for a dental practitioner. This case report describes the treatment of an ECR in the upper left central incisor, which was treated surgically following endodontic treatment using the new dental cement Biodentine to repair the cervical defect. Scrub typhus is one of the most common causes of acute febrile illness in South India. The clinical features vary from mild illness to severe complications such as gastrointestinal bleed, acute respiratory distress syndrome, meningoencephalitis, and acute kidney injury. The pathological findings are characterized by vasculitis of small vessels of the involved organs. 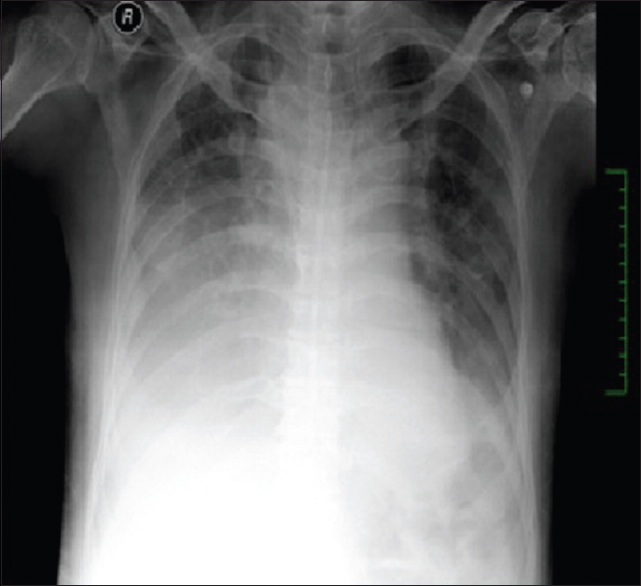 We report probably the first case of scrub typhus-related hemothorax in a 72-year-old diabetic male who presented with acute febrile illness with shortness of breath and acute kidney injury. The patient improved with azithromycin and hemodialysis. Gingival recession is not only an aesthetic concern but also often is associated with problems such as tooth hypersensitivity. Among various root coverage modalities, free soft-tissue gingival graft shows promising results, but is associated with patient discomfort due to the need for second surgical palatal donor site. 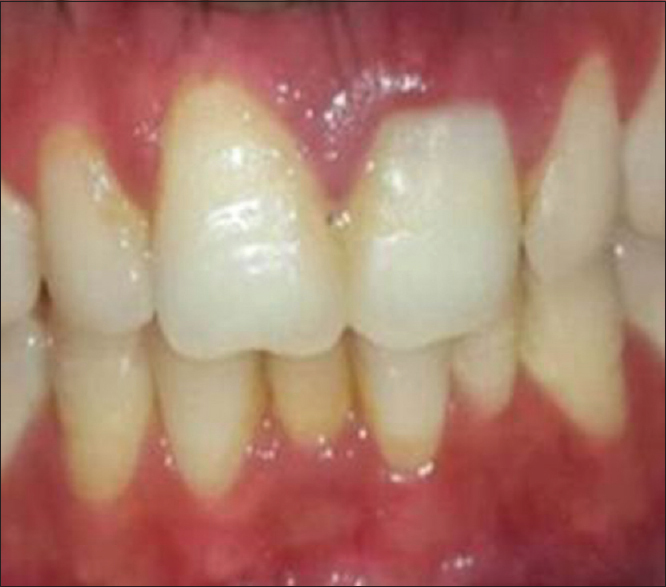 The purpose of this case report is to evaluate the effectiveness of platelet-rich fibrin (PRF) at donor palatal site with root coverage procedure in the treatment of recession-type defects. This paper reports a case of a 31-year-old male with a root coverage procedure, and employing PRF at donor site has been discussed below. Hence, the employment of PRF at donor site not only enhances healing but also reduces patient discomfort that occurs due to palatal plate. Myasthenia gravis (MG) is an autoimmune disorder in which there is antibody formation against acetylcholine (ACh) nicotinic postsynaptic receptors at the neuromuscular junction of skeletal muscles. Bulbar muscle paralysis is common, along with weakness in head and neck flexion. Extraocular muscle weakness or ptosis is the initial presentation in 50% cases and >90% cases during illness. It is usually treated with medications such as ACh-esterase inhibitors or immunosuppressants. Selected cases require thymectomy. Here, we present the case of a 32-year-old woman with MG, who presented with an unexplained respiratory failure in the absence of typical ocular symptoms. The diagnosis was based on clinical suspicion and specific laboratory tests. She was stabilized with mechanical ventilation and subsequently treated with immunoglobulin therapy and thymectomy.